Simply trap your wire, rotate the top cap, and you get that perfect micro coil in seconds each and every time. 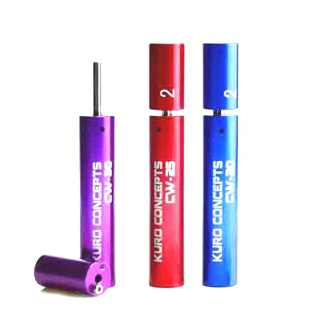 Blue CW-20 - Make 2 mm coils, Red CW-25 - Makes 2.6mm coils, Purple CW-30 - Makes 3mm Coils. Insert wire through hole on the side of the handle. Leave about 1/2" of the wire protruding from the hole. Hold the end of the wire against the handle so it won't pull through. Pull the loose end of the wire around the shaft. Slide the winder section over the shaft with the pin facing toward the handle. Turn the winder section so that it catches the wire and starts wrapping it around the shaft. Keep light pressure against handle while winding. Excessive pressure will force smaller gauge wire to wrap over itself. When finished, remove winder and straighten the wire end that protrudes from the hole in the handle. Push up on the wire to slide coil up. Carefully grab the coil at the bottom to slide it off the shaft.